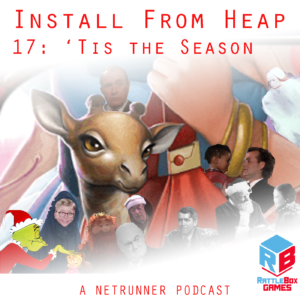 Join us for this Holiday-themed Netrunner extravaganza, at nearly 30 minutes. Hold on to your butts. Correction: Fair Game Netrunner nights on Tuesdays, not Mondays. Core Set is out now! Holidays coming up – delay in next episode maybe? Core + 1 — Make a deck using a single Core 2.0 plus ONE data pack.